Davis Mobile Auto Repair, in Davis, CA will save your money and time by going to a mechanic shop. We eliminated towing costs and the inconvenience of going back and forth from the auto shop. We are always here in Davis, CA to help at any time in any condition. Davis Mobile Auto Repair is your source for top quality auto repair and maintenance services in Davis, CA. Our ASE Certified technicians have the latest diagnostic equipment and experience to provide auto services for all makes and models. Our mechanics are always happy to help you no matter wherever you are with everything from a routine oil change, to a complex transmission repair! In addition to full-service general auto repair services. Our knowledgeable and friendly mechanics are focused on providing great customer care. Our commitment aims to provide not only competent repair of the problem but also the location and correction of the cause. We offer realistic service, discussing your options where they exist, even in last hour emergencies. Give us an opportunity to help at any time. 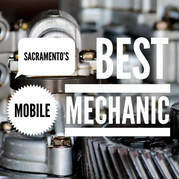 Don't forget to call us at Davis Mobile Mechanic -916-306-5254., If you are in Davis, CA.